A strong, stretchy, continuous filament yarn which is dyed using colorfast dyes preventing it from fading. The easiest yarn to tie. Cut & trim for eggs or Glo Bugs, sculpt patterns like sculpins and woolheads. 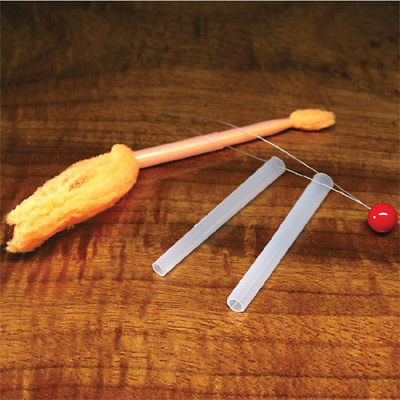 It is spongier and more compact than standard egg yarn making it great for smaller egg flies. McFly Foam absorbs water and sinks faster than yarns and other natural materials. 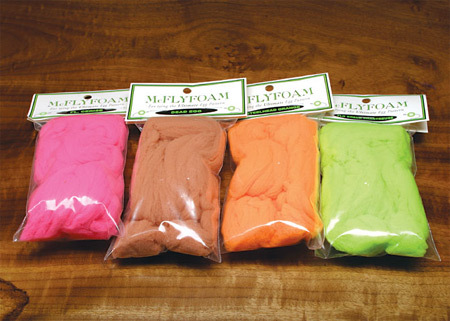 McFly Foam comes in a stringy "wad" approximately 4" long and 2½" wide. See Color Chart. Includes 3 different size tubes that allow you to thread McFly Foam through and tie with no waste. By changing the amount of material you thread and the tube size you choose, you can make small, standard or large size flies. Also includes a threader and very detailed instructions.